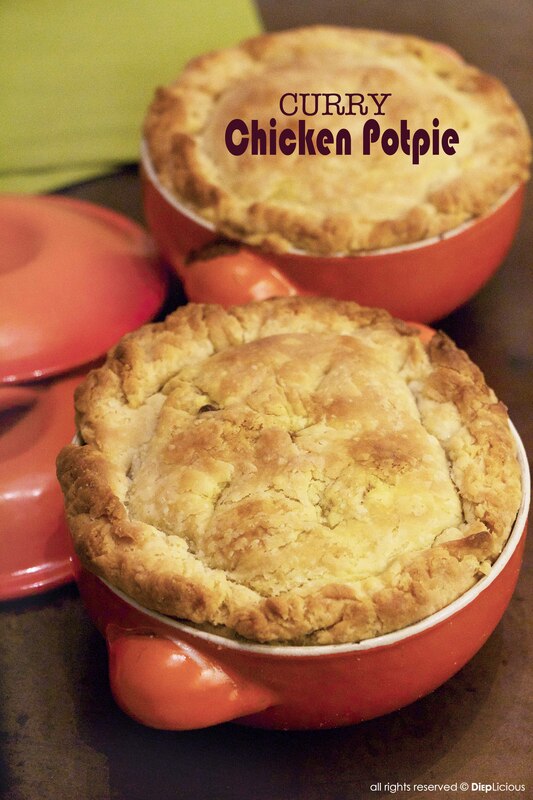 Chicken potpie is one of my husband’s favorite meals, and I have to admit that eating this on a cold day hits the spot. This curry version is a twist on the classic comfort food, and is one of my guilty pleasures. 1. Add butter, flour and salt together and mix with a dough cutter until the mixture resembles coarse meal. Sprinkle with 3 tablespoons ice water mix until the dough is crumbly but holds together when squeezed (if necessary, add up to 2 more tablespoons of ice water). Be careful to not overwork your dough, as this will make it difficult to roll out. 1. Preheat oven to 425°F (220 °C). 2. Put the chicken, carrots, peas and celery in a pot and cover with water (Make sure there is enough water to cover the ingredients). Boil for 15 minutes, drain the chicken-vegetable mix, and set aside. 3. Heat butter in a saucepan over medium heat, and then add onions and sauté until soft and translucent. Add curry and sauté for another minute before adding salt, pepper and flour. Slowly stir in chicken broth and milk. Let the mixture simmer over medium-low heat until thick. Remove from heat and set aside. 4. Sprinkle flour on a work surface and roll the dough out to 1/8-inch thickness. Place the dough over a dish and cut off any excess dough that overlaps. Roll out a second disk for the “lid”. 5. Place the chicken and vegetable mixture in the bottom of the piecrust. Pour the curry mixture over and cover with the second disk. Seal the edge and cut away excess dough. Make small slits in the top to allow the steam to escape. 6. Bake in the oven for 30-35 minutes, or until the crust is golden brown. Cool for 10 minutes before serving. 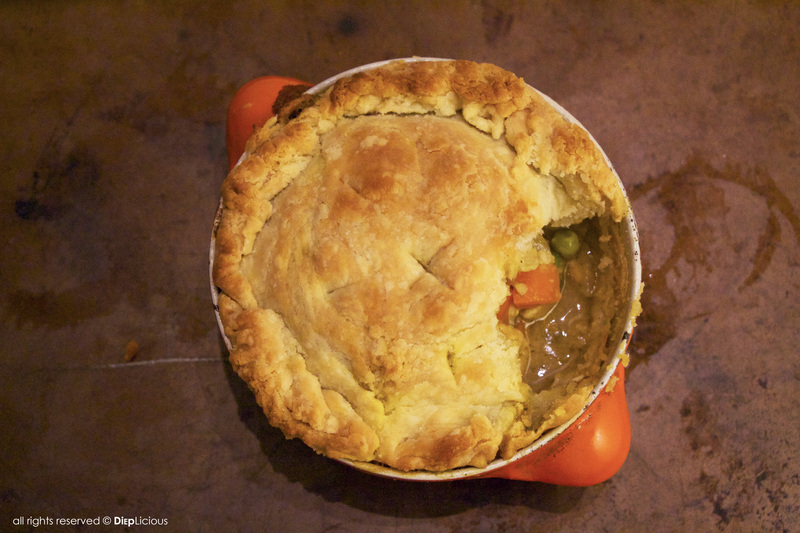 Mmmmm curry pot pies??? Yes please!